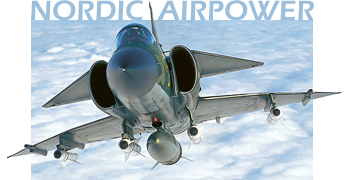 Nordic Airpower is a publishing company established in 2010 by Jan Jørgensen, with the purpose of producing and publishing English language books about military aviation within the Nordic countries. Nordic Airpower is based in Denmark, but have good connections to Norway, Sweden and Finland. Not many English language publications currently exist about military aviation in the Nordic countries, so there clearly is a need to be fulfilled. So far Nordic Airpower have published a series of books about military aviation in each of the four Nordic countries, and next in production will be a series of similar type of books about the Saab classic jets (Tunnan, Lansen, Draken, Viggen and Gripen). To provide an insight into what it takes to produce the pictures for the book, we have selected a few pictures from them and will explain the background for each. To cover the historical span of the books, one old and one new picture have been selected from each book. The new pictures have been taken by Jan Jørgensen, while the old ones are from the archives of various friends, as credited. 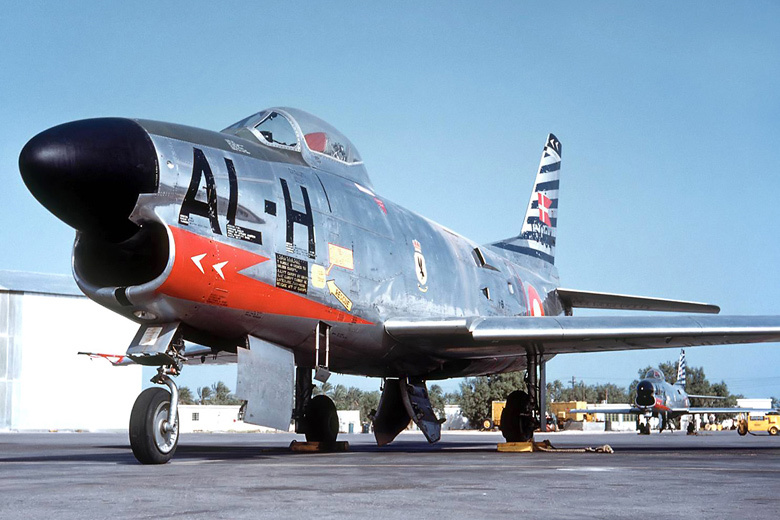 North American F-86D Sabre, serial 51-6034, code AL-H, of Eskadrille 726 based at Ålborg. This picture was taken during a deployment to Wheelus in Libya in the late 1950s, where the Danish Sabre units routinely deployed to practice live missile shooting. 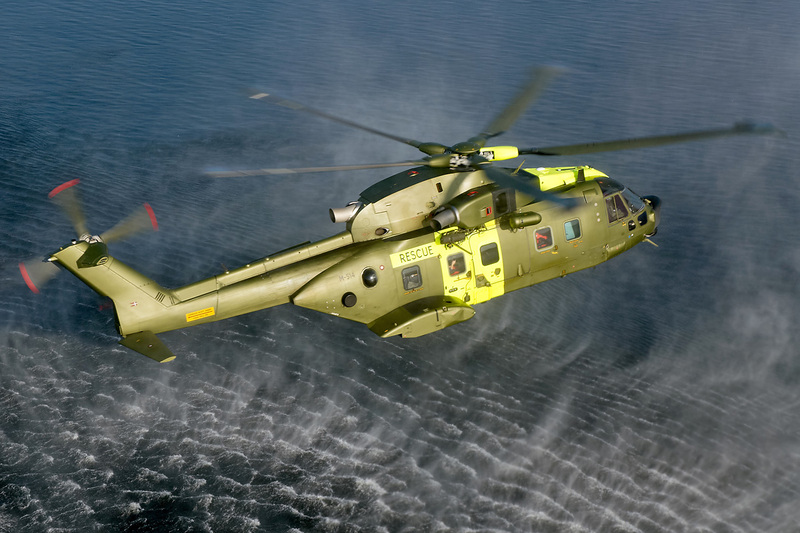 Agusta-Westland EH.101 Merlin Mk.512, serial M-514, of Eskadrille 722 based at Karup. Picture is taken in September 2008 over a lake east of Karup, from the open rear ramp of another Merlin. We had about 10 minutes to produce air-to-air shots at the start of a local training mission. After making a series of head-on shots of M-514 manoeuvring behind the other Merlin, we sweeped down low over the lake with the two Merlins more or less side-by-side, producing this striking shot. North American P-51D Mustang (J26 in Flygvapnet service), serial 26007, code Green 7, of F16 wing based at Uppsala. Picture is taken in February 1953 from another Mustang. 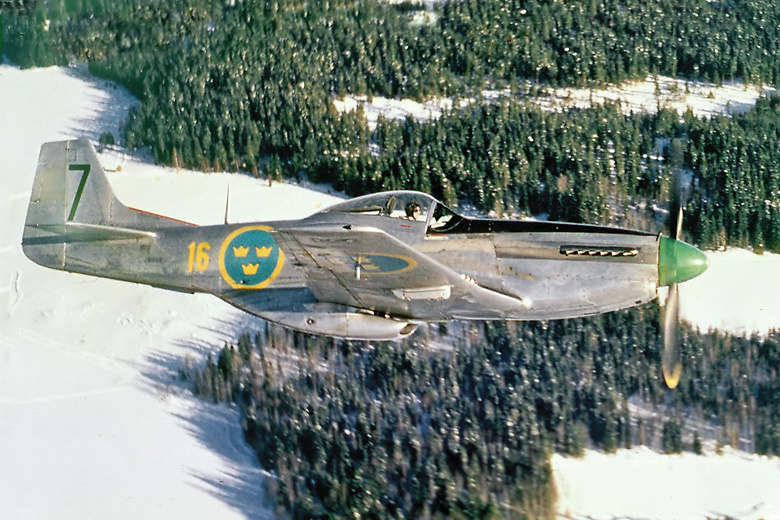 This extremely rare picture is one of only a very few in-flight colour pictures that exists of a Swedish J26. Saab SK37E Viggen, serial/codes 37811/73 and 37817/75, of F21 wing based at Luleå. 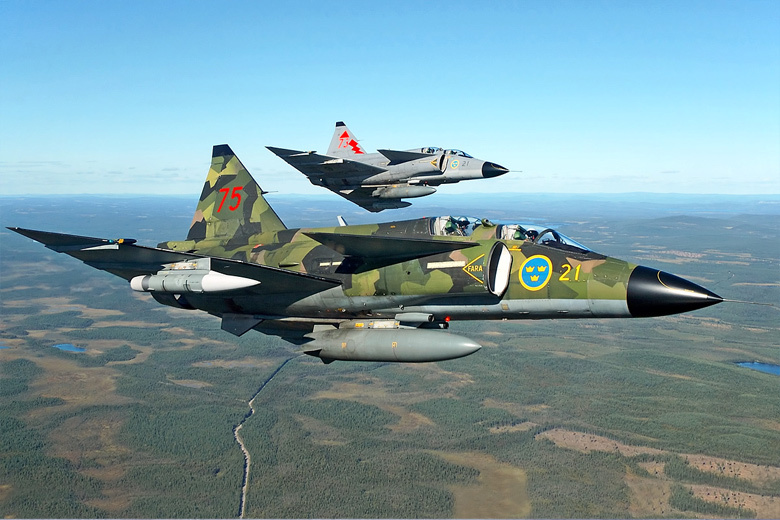 This photograph was taken above northern Sweden in August 2005, from the back-seat of another Viggen. This was during the final months of Viggen operations, as the type was retired from Flygvapnet operational service by the end of that year. We had a three-ship SK37 sortie to produce some last air-to-air pictures of the mighty Viggen. Most of the time was spent taking pictures while manoeuvring in the vertical plane, which was not possible with the usual SK60 photo platform, but also this nice horisontal view was produced. 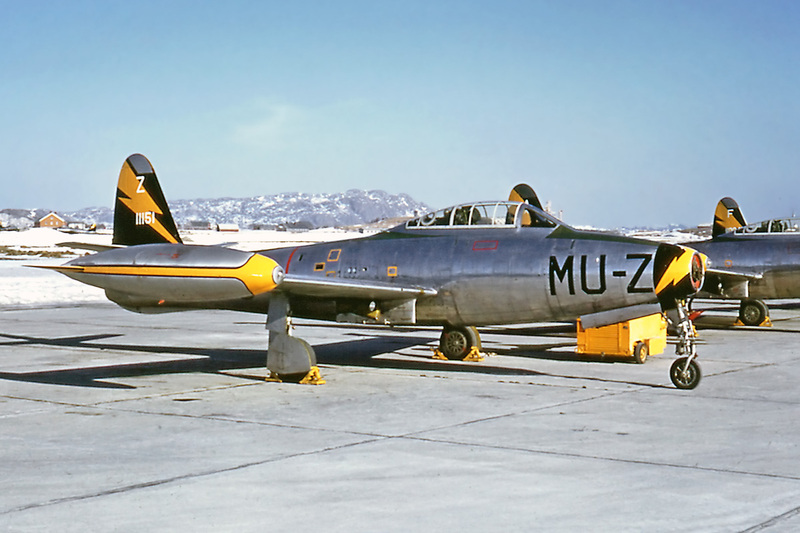 Republic F-84G Thunderjet, serial 51-1151, code MU-Z, of 338 Skvadron based at Ørland. Picture is taken at Ørland in 1959. Norway operated 200 Thunderjets painted up in colourful unit markings, but only very few colour pictures of good quality exists today. 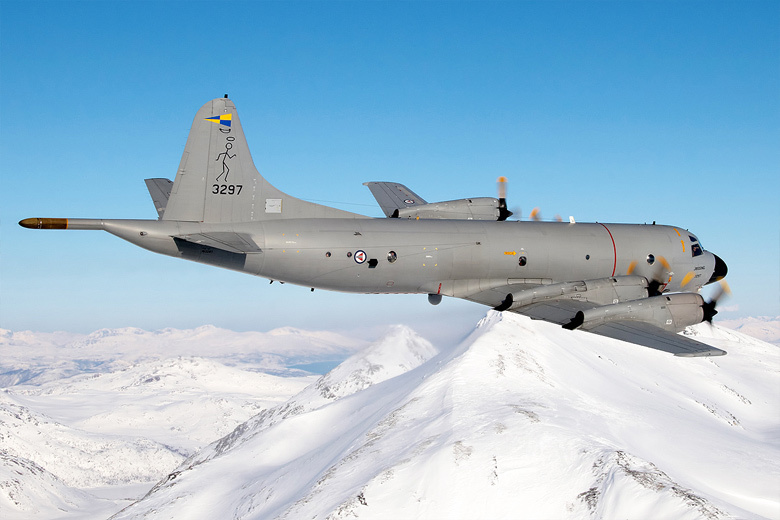 Lockheed P-3C Orion, serial 3297, of 333 Skvadron based at Andøya. Picture is taken above Senja near Tromsø along the coast of northern Norway in March 2009, from another P-3. It is extremely rare that 333 SKV have two Orions in the air at the same time and place, but creative planning of one operational and one training mission made this possible. The two aircraft met over the Atlantic north of Tromsø and flew together back to Andøya, giving time for a little manoeuvring which produced this nice shot. 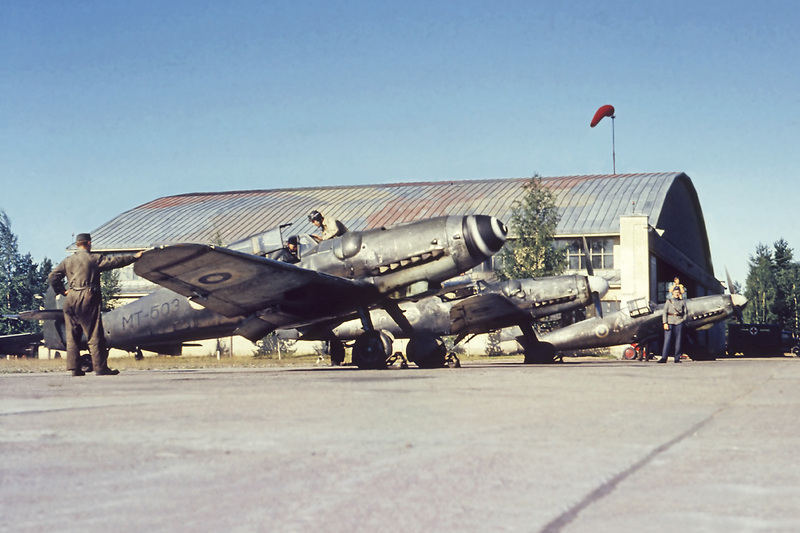 Messerschmitt Bf109G, serial MT-503, of 3rd Lennosto (3rd wing) based at Utti. Picture is taken at Utti in 1953. The Bf 109G was the Ilmavoimat's most numerous fighter ever, and the type achieved an impressive kill ratio of 25:1 against the Russians during the socalled Continuation War in 1941-44. Colour pictures of Finnish 109's are extremely rare. Mil Mi-8, serial HS-11, and NH Industries NH90, serial NH-208, of the Helikopteripataljoona (Helicopter battalion) based at Utti. Picture is taken above the Land of a Thousand Lakes near Utti in May 2010, from a Hughes 500 from the same unit. 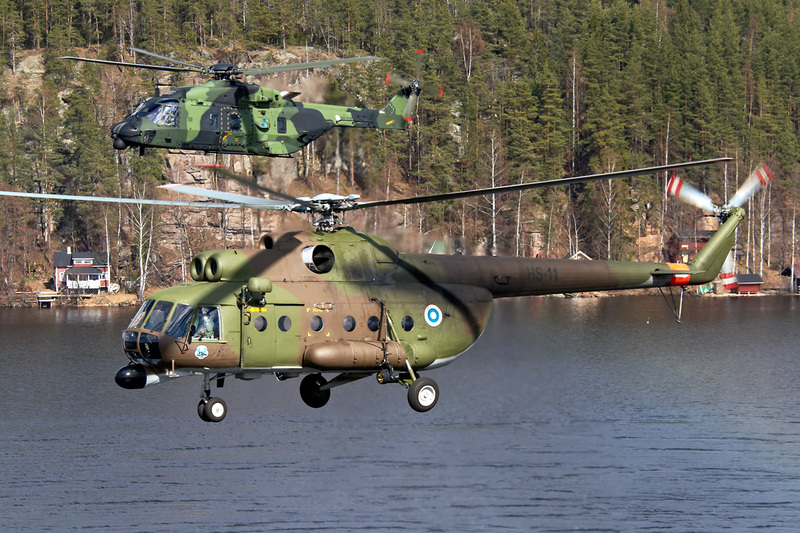 At that time only two Mi-8 were still flying with the Helikopteripataljoona, and the unit was heavily engaged in converting to the new NH90. Shooting air-to-air of helicopters from helicopters is always a challenge, as the slow shutter speeds required to produce a full rotor disc are somewhat incompatible with the usually very bumpy ride, so a compromise is needed.